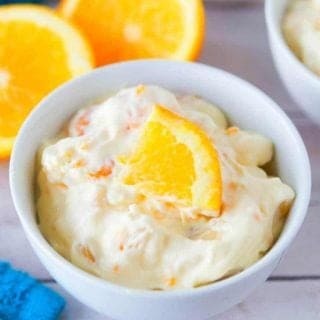 I love me some no-bake fluff salads. They are light, refreshing and quick to make. 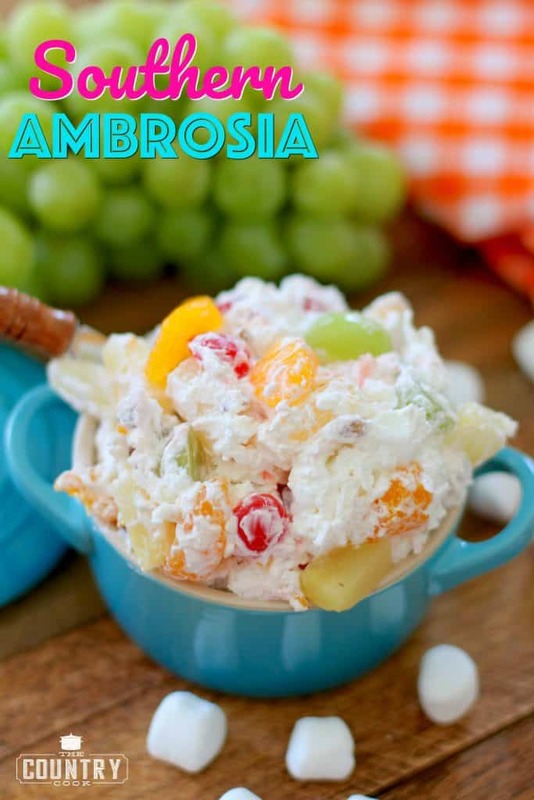 I’ve shared a number of them here on the blog over the last few years: Southern Ambrosia, Cherry Pie Fluff, Pistachio Fluff, Weight Watchers Orange Fluff and Pineapple Fluff. 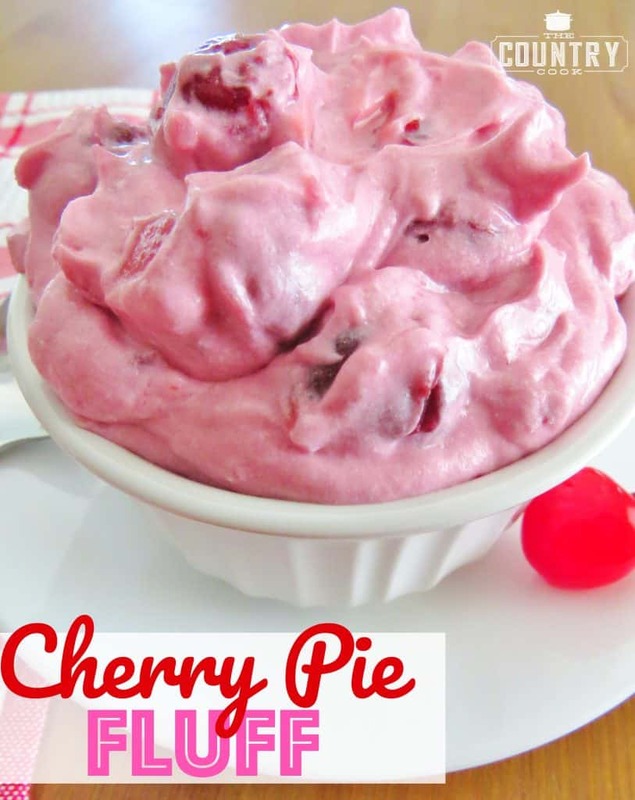 They all pretty much start with COOL WHIP and then additional ingredients are added to make them a little different. Now, the one question I always get is: “Can I use something else other than COOL WHIP?” My answer to that is: “If you must, you can make your own whipped cream.” I am honestly not the best person to ask those questions. Because if I have shared a recipe that calls for COOL WHIP, then chances are, I have only made it with COOL WHIP and can’t really help out with any other way to make it. Plus, unlike a lot of food haters/shamers out there, I like frozen whipped topping (COOL WHIP). You know those people I am talking about. We see them all over social media: “I would never use COOL WHIP – I only make everything homemade!” or “Ewwww, cream of chicken soup? I would never feed that to my family.” They are so very judgy, right? Hey, I like cream of chicken soup and I use it in lots of dishes. 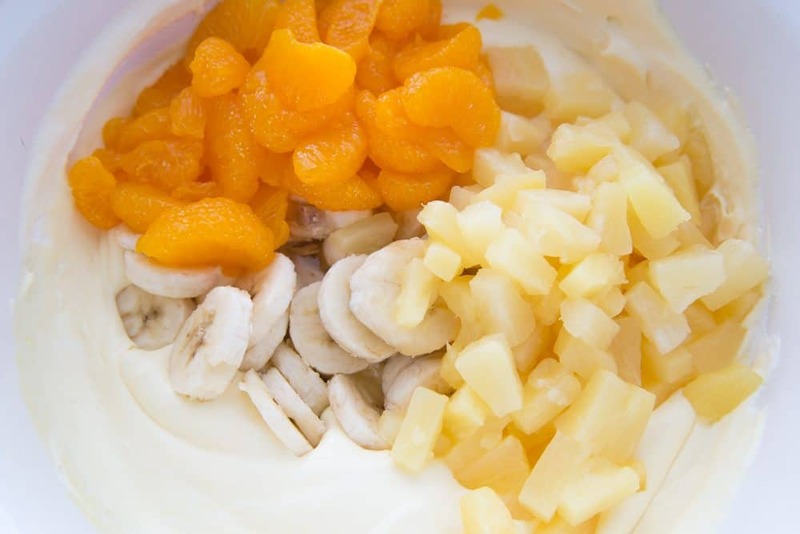 In a large bowl, using an electric mixer, combine pudding mix, milk and orange juice concentrate. Beat on medium speed for about 2 minutes. Stir in the whipped topping. Gently mix in the fruit. Cover with plastic wrap and chill in the fridge for 2-3 hours until ready to serve. 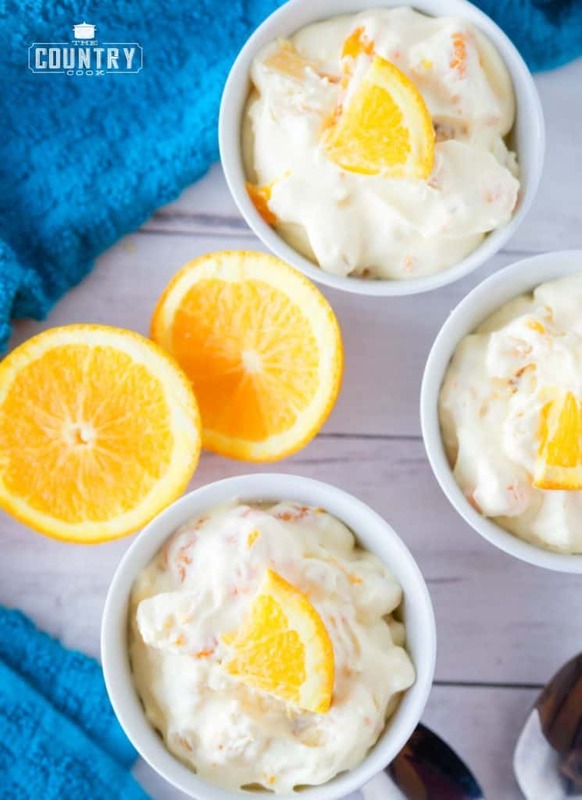 Orange Creamsicle Fruit Salad is a no-bake dessert full or mandarin oranges, pineapple tidbits and bananas in a creamy pudding. I too like simple, down home food. Thanks for another fluff recipe to try. Where have you found orange juice in the frozen state? I’ve looked all over! You are a MESS, Brandie. I LOVE your sense of humor! I take any shortcuts to flavor I can get. No judging here! Anyone who calls me a mess is my new friend. That describes me perfectly!! LOL! In the freezer section of the grocery store.Minute Maid has a real good one, or you can use the store brand. Thanks so much Sharon! Glad to have you here! This looks delicious and you are hilarious!! I would prefer it without the banana. They turn weird. I wonder if the bananas could be put into the orange juice to prevent them from turning brown? (Just a thought, since lemon juice prevents apples from turning brown). Not sure if it would work but just wondering. Great recipe, Brandie!! My coworkers loved it! Thanks for the recipe! Ya know, that is an idea. I bet it would work! Let me know if you try it and how it does! Thanks so much Stephanie! Very funny and I agree with you! I was having lunch with my SIL the other day and she was talking about how she and her sister are food snobs and never would consider using a cake mix. Sigh…whatevah. I’m 47 years old and will unapologetically use a cake mix if I damn well please. I’ve grown very tired of Judgey McJudgersons. If it ain’t easy, it ain’t gettin’ done! I couldn’t agree more Barb! At the end of the day, as long as we made something together and enjoyed it together – that’s what counts! I think some cooks have unlimited budgets too. Sure I might like to use organic produce and gourmet meats and artisans breads and real butter instead of margarine and the list goes on. I , however , have a very limited monthly income and therefore my grocery budget does not include expensive foods. I cringe when I read a recipe that says 2 cups of chopped pecans. In my grocery that would be close to ten dollars for that ingredient alone. I buy pantry supplies when they are on sale, use coupons, buy what is seasonable, use generic brands and do the best I can to make healthy and tasty meals . I guess I am just venting because I get so tired of the “food superiors” acting as though they are doing so much better. I would love to see their dishes with money restraints. I raised three sons and they are all healthy and happy and they ate what was on the table happily. Very true! I think many folks just simply forget how privileged they are. They may not think they are privileged but compared to others – they really are! We have to step back and realize that not everyone can afford a $15 bottle of Madagascar vanilla. But at the same time, we ALL deserve a little sweet dessert, right? I don’t even publish those judgy comments anymore. It only hurts others who read this blog and once someone posts something negative, it becomes a “herd” mentality and everyone jumps on and agrees and it just gets worse. It’s like that on social media. Once you let one person get a negative word in – it all becomes too much. We keep it positive and nonjudgmental here. It’s the safe space on the internet – ha! I have to agree Brandie! Sure, I like to bake from scratch and I am fortunate to be able to do so. But, and this is a BIG BUT, give me quick and simple any day! My family loves my home made pound cakes & I will always make them from scratch. But, if a recipe I like has boxed ingredients, I go for it. Love your recipes, everyone I have tried has been great! Thanks for everything and for being a positive person. No food snobbery here at my house! 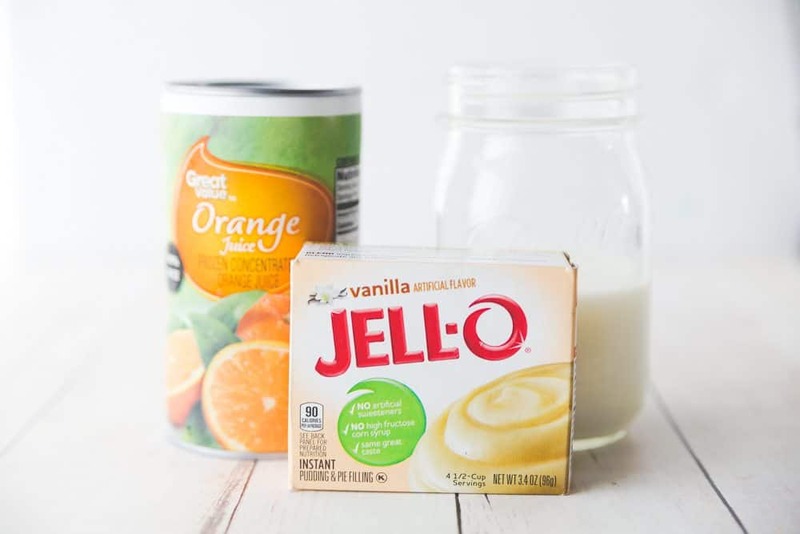 The orange juice concentrate will have more orange flavor than the already mixed OJ. Came across this site when looking for an inexpensive and easy to make stroganoff. I live on a tropical island and everything is imported therefore everything is expensive. I must choose recipes carefully yet still make something that I like, hopefully something I can freeze and if having company, something I can make for under $100.00 — for 3 to 4 people. I am a basics person, I don’t do fancy and I don’t try to impress guests. As long as I don’t poison them, I consider it a success. 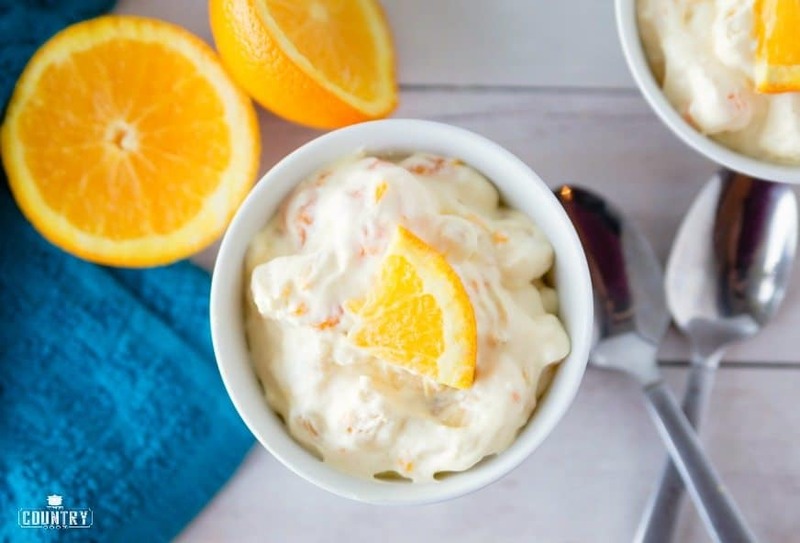 COOL WHIP is about $5.00 US for a container but the creamsicle fluff looks so darn good that I will buy that plus a $6.00 US tin of frozen oj. I have been browsing other recipes here and they all look sooooooooooo good. Thank you for this blog. Since I posted a comment in May, I have retired!! Yeah! And I’ve made your creamsicle fluff a few times. We love it! On a tighter budget now, so haven’t used bananas. I will definitely let you know about adding them to o.j. to prevent browning. Going to check out your other recipes! Congrats Stephanie!! Woo hoo!! Thank you so very much! Well Brandie, I just turned 73 and use cream soups, store bought dressings, AND Cool Whip! Don’t let the nay sayers get to you.down! We all come from different places, incomes,and circumstances.. None of us are feeding our families inferior food. We are trying to do the best we can with what we’ve got.out of our love of the people we are feeding. I looked through some of your recipes. I see delicious well prepared food. Keep blocking the judgers! 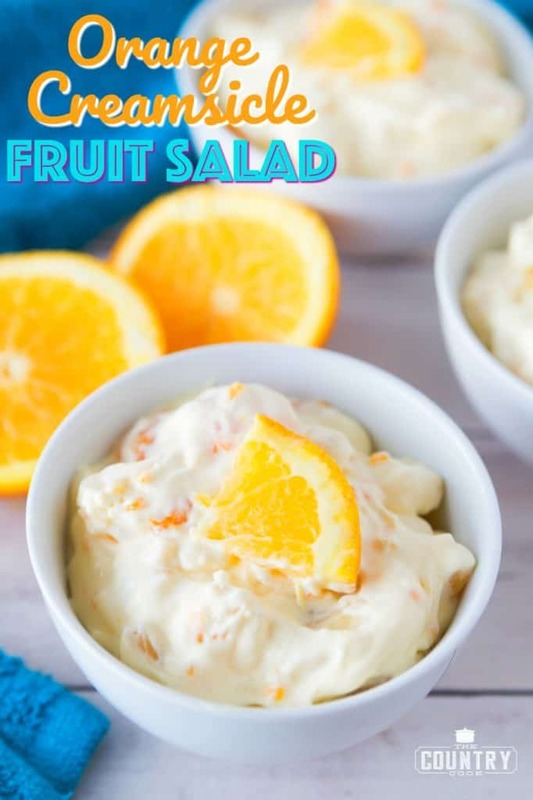 I came here looking for the Orange-Creamsicle Fruit Salad and have pinned it. I also got a little angry that others have made you so defensive about your recipes. Just remember for every food snob there are two others that will welcome and love your recipes. Keep on the way you are. Thanks for the recipe. Best wishes, Barb.